Dynamic Dent Repairs are based in Chelmsford but cover Essex, Cambridge, Bedford, Northampton and surrounding areas. 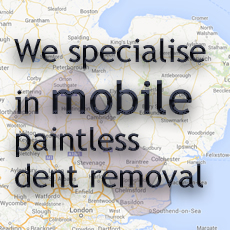 Completely mobile (based in Essex), Dynamic Dent Repairs comes to you - no need to book your vehicle into a bodyshop for days on end. Get a FREE quote now!